I have been an avid outdoor enthusiast for the past 25 years. I enjoy a variety of outdoor activities including mountaineering, day hikes, multi-day backpacking trips, river and ocean kayaking, back country skiing, snowshoeing, mountain biking and rock climbing. I have climbed and hiked throughout British Columbia, the United States and when opportunity presents itself in Europe and India. I carry a wide variety of gear depending on the type and length of trip. I am a Search and Rescue team member in the Southern Rockies and am part of the swift water, rope rescue technical teams and ground search team. The Black Diamond Transfer 7 shovel is a light-weight high-volume snow shovel. Its large shovel blade and extendable handle allows for the capturing of large amounts of snow in relatively confined spaces such as snow pits. The Transfer 7 Shovel is made of areospace aluminium. The extendable handle has a triangular design and comes in two pieces allowing for it to be extended. Black Diamond has incorperated a T-shaped grip with button style release points for extending the shovel shaft and inserting the shaft into the shovel blade. The large blade has a deep surface and a slightly pointed blade. I have been using the Transfer 7 shovel for the past four years during my winter excursions in the Southern Canadian Rockies and on the southwest coast of British Columbia. 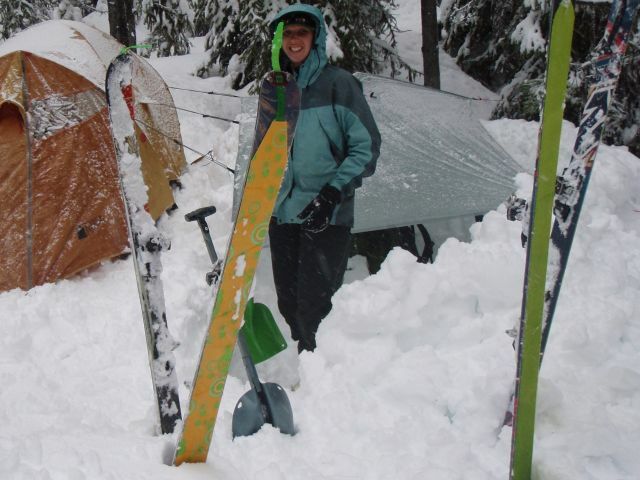 I take the shovel on all my winter day ski trips as well as on many weekend overnight trips. Conditions have varied from -25 C (-13 F) to 0 C (32 F) in winter and some spring trips with a pleasant 5 C (41 F) to 7C (45 F) daytime high. I have used the shovel on a variety of snow packs including rain crusts, light powder, wind slabs, hoarfrost layers, consolidated snow as well as digging in settled avalache debris zones. In total I have used the Transfer 7 Shovel on an estimed 40–50 occasions. The Transfer 7 Shovel is a relatively light shovel for its size at 770 g (1 lb 11 oz). I chose it mainly for its high-volume shovel blade and relative light weight. 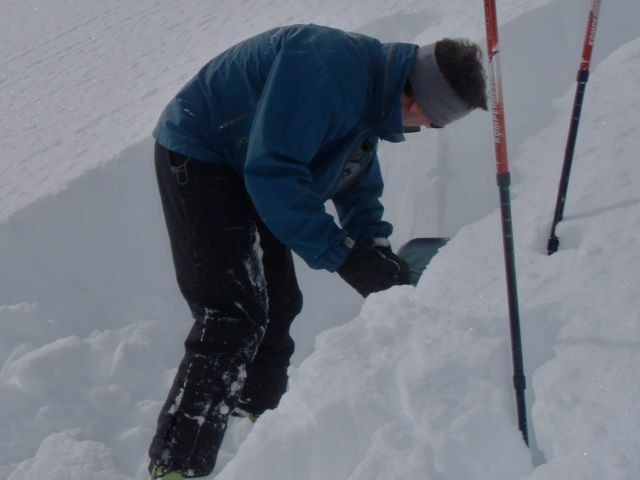 I have used the shovel mainly to dig snow pits in order to evaluate snowpacks duing backcountry ski trips. The deep shovel bade and extendable handle allow me to move large volumes of snow in quick order. The only down side that I have run into is that the edges of the shovel are quite rounded making it challenging to achieve a nice corner with which to make my snow pack observations. The collapsible handle makes it easier to work in a snow pit after the initial excavation. I have found that snow does stick to the inside of the shovel blade along the handle insert on occasion. The Transfer 7 Shovel can be taken apart for easy packing, with the handle removable from the shovel blade. I have found that even though it’s a high volume shovel blade, it fits in all but my smallest backpack. The only backpack it did not fit into was my 9 L (550 cu in) hydration pack, not that this was a big surprise. The release buttons are large enough that I can unlock the handle and blade easily even with thick mits or gloves. Even when shoveling heavy wet coastal snow I have not had any issues with snow or ice build up around the locking buttons, which was nice to find out as dismantling the shovel after use can be a pain when the buttons freeze up. The sturdy aluminium blade has a slightly triangular shovel point and long extendable handle making it effective when digging through consolidated snow packs or in avalanche debris. I found the shovel very effective even through the most compact snow. The Black Diamond Transfer 7 shovel is a fairly light, high-volume snow shovel that will move lots of snow when needed and is very effective for digging into avalanche debris. 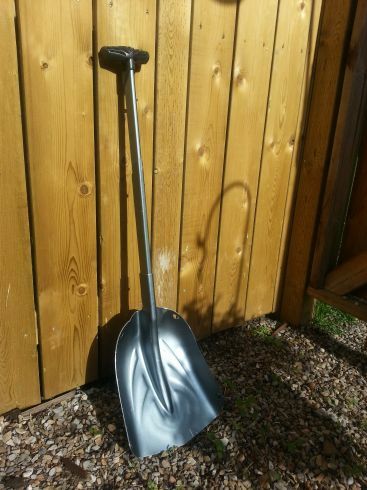 Overall I am very pleased with this shovel and would recommend it for venturing into the backcountry in winter.